How to pull data from SaaS software, enterprise apps behind a firewall and SQL databases onto every device you own. This article is a guest post from Databox consulting partners, Michael Paladini and Shafeeq Rahiman of Analysis Factory, a 15-year-old business intelligence consulting firm. At Analysis Factory, our team has been implementing data visualizations for Fortune 500 companies for the better part of two decades. Back in the beginning, we had to build every dashboard from scratch, pulling and storing data, writing code and designing charts. Now, we use systems like Databox, Tableau and other tools to visualize data more easily, often right from the source with no coding or data manipulation needed. If you’re one of the thousands of Databox users, you probably didn’t code anything to get your visualizations either. In fact, most Databox users simply use an ever-growing list of native connections (e.g. HubSpot, Facebook ads, Google Analytics, AdWords, Localytics, Salesforce, MailChimp, etc.) – all built by the Databox team – to very quickly visualize data from 100s of sources. However, most enterprise Databox users need to pull in additional data from other places. When users needs to pull in data from other systems, that’s where we excel. For decades we’ve been connecting to data from a myriad of sources and then building visualizations, often in HTML. While Databox makes it easy to build stunning mobile, desktop, and TV reports — no HTML or coding needed — there may be technical work required to connect to some data sources. Enterprise sales and marketing applications like SAP, Microsoft Dynamics, Eloqua and Marketo. Financial data, such as FactSet. Nielsen data for media saturation. It doesn’t end there, though. Many enterprises also need to visualize data stored in enterprise apps behind firewalls. And so much management data still lives in standalone spreadsheets too. So, how does all this disparate data flow into Databox, and more importantly, into your data visualizations and analyses? Via custom connectors. 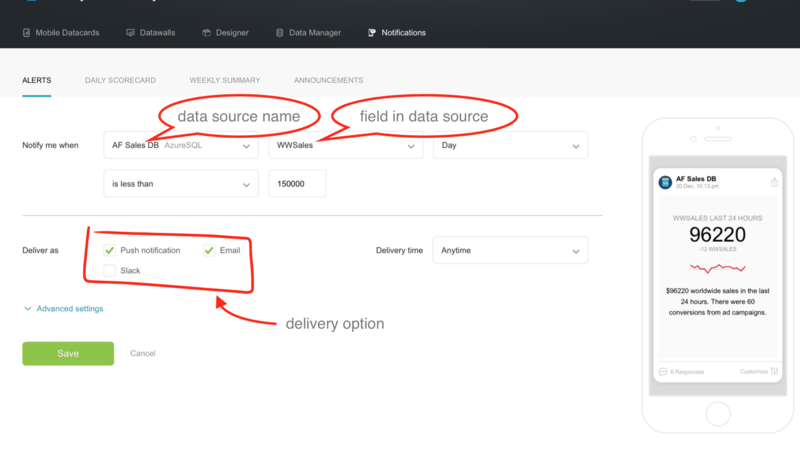 Before we describe how custom connectors to Databox work, though, let’s define what we mean by native connectors more clearly. Databox’s native connectors provide integration with a wide variety of popular cloud services: preconfigured data connections and metrics that work right out of the box. With these native connectors – accessed with a click or two – you can pull in data and build reports using their drag and drop report building interface. You can configure mobile reports (Datacards), desktop/TV reports (Datawalls), set goals, set up email alerts and push notifications — all without writing a line of code or even looking at your data. When data can’t be pulled in through one of Databox’s native connectors, that’s when you need a custom connector. Although this requires some data preparation, once the custom integration is completed, these non-native data sources can be used seamlessly with native data sources within the Databox system. This custom integration layer allows the aggregation of data from disparate data sources, regardless of its source, from the cloud or from within the enterprise firewall. 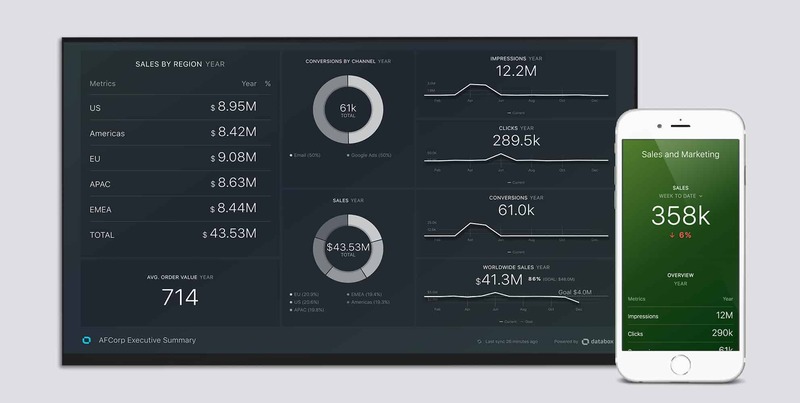 Using custom connectors, you can blend data from practically any source, directly inside Databox, then access all your KPIs in powerful data visualizations on your mobile, desktop, Datawall, or Apple Watch®. To demonstrate how custom connectors can be leveraged, we’ll share how we built a sales and marketing dashboard with data from multiple data sources. In larger organizations, this data is often neatly tucked away under layers of firewalls and corporate red tape. And ironically, many sales and marketing leaders still rely on standalone spreadsheets to set up and track their targets. (Management teams love their spreadsheets!) Doesn’t matter where the data is, though. 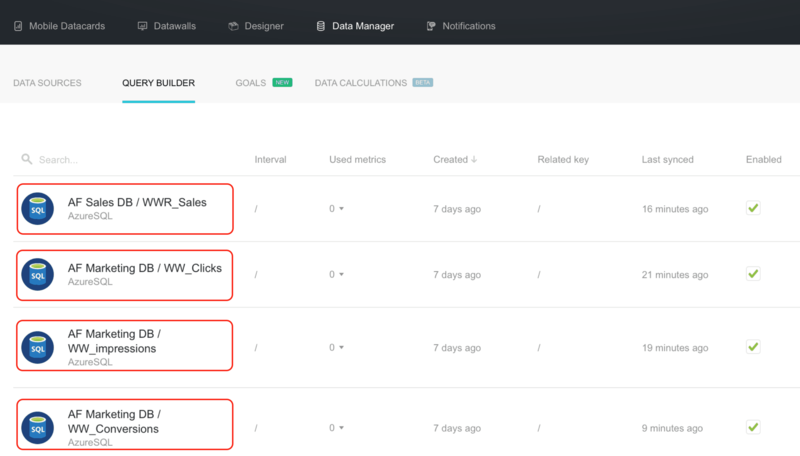 So, for this example, we’ll connect sample databases from Enterprise Sales and Marketing Departments to Databox, build queries to pull out specific insights from the blended data, and then set up a data calculation, customs goals, and an alert. 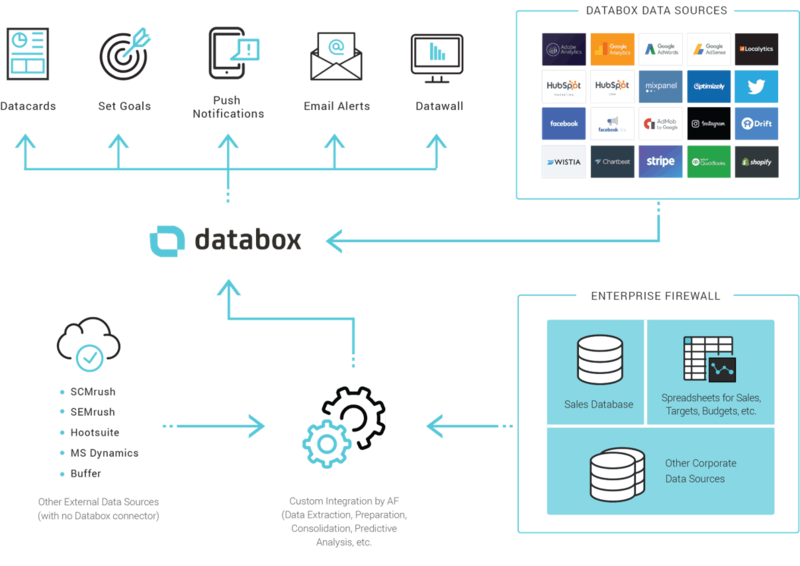 There are several different approaches to connecting Enterprise data to Databox. For this example we’ll upload the Enterprise data into a cloud database, then use AzureSQL to connect the database to Databox. Identify all organizational metrics needed for your reporting. What business issues does your Datawall or Datacard need to address? What metrics need to be tracked to answer these questions? What goals need to be identified? What alerts need to be set? Identify how and where these metrics are generated and maintained within the organization. Are they in databases? Spreadsheets? Are they in a format that will allow systematic access such as web service/Excel spreadsheets on the network? The next step is to build a home for this data in the cloud, sometimes referred to as a “data mart.” For our demo, we chose AzureSQL as our cloud database. Under Data Manager, we’ll configure two data sources to connect to our AzureSQL database. Once activated, the data sources appear in the Data Manager list of sources. Queries can be run and tested on this same screen within Databox, and results can be viewed and verified. Then we set up data calculations inside Databox, as well as custom goals within the app. Data calculations enable you to create on-the-fly calculations, regardless of whether the fields for calculations originate from a single data source or different data sources. 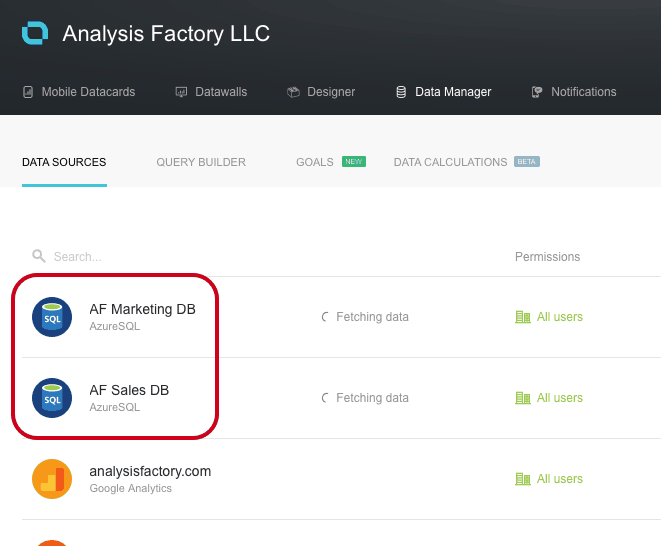 For example, you can set up a data calculation with your Google Analytics data (from the native Google Analytics connector) and your custom sales data (from your sales database). Notifications can be sent as push notifications, emails and even as Slack messages. We’ll set up an alert for the sales leadership team that notifies them they don’t attain $15K in new revenue in a day, sent as a push notification to mobile users. Finally, here’s a Datacard and a Datawall that we created based on this dataset. If you’d like to try out a live version, just follow this link. With Databox, we have the ability to visualize any data we can get access to. 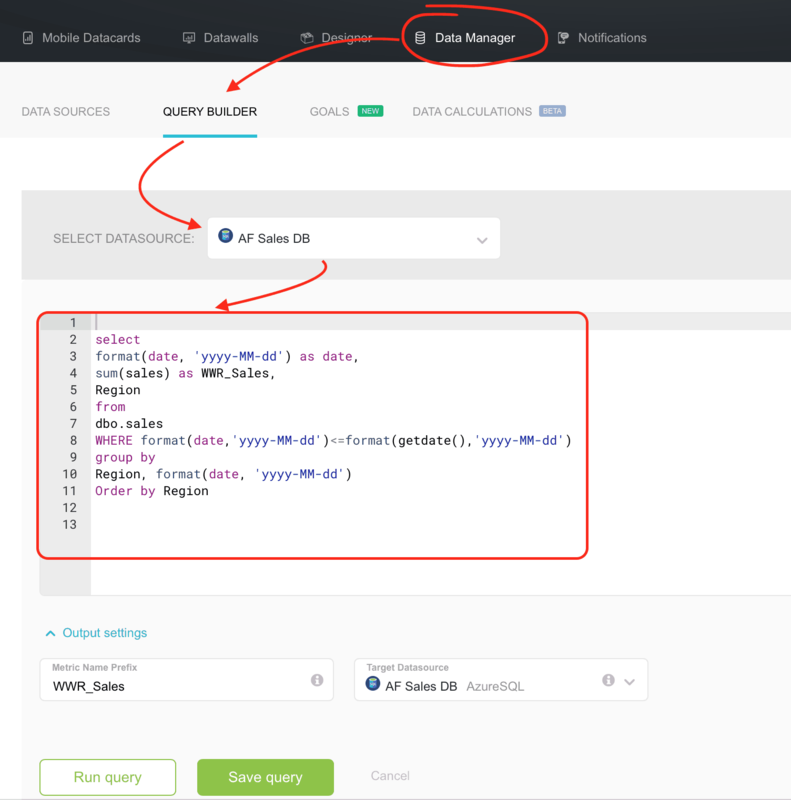 Using the native connectors, Zapier connections or SQL connections, we can get the data into Databox. From there, Databox makes it easier than ever to visualize, track progress to goals and alert your team if something isn’t going to plan (or celebrate when it is) via Databox alerts. 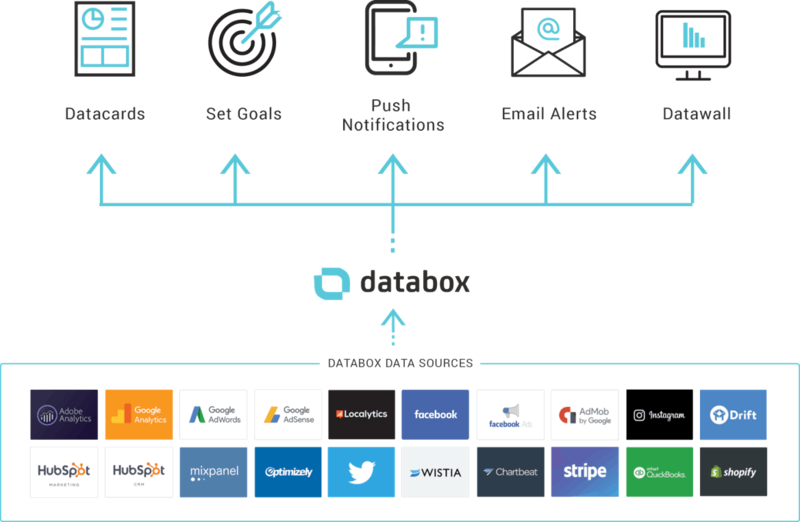 Hopefully, the step-by-step procedure we’ve laid out above helps your organization get up and running with Databox and on your path to being more data-driven. If you want to discuss how to visualize any data from anywhere with the experts at Analysis Factory, drop us a line to talk about your project. Analysis Factory builds innovative, outside-the-box business intelligence solutions, tailor-made for the business needs of each client.